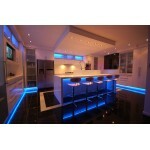 Similar to other industries, trends in kitchen remodeling and designing also keep on evolving with time. While styles come and go, there are some trends and cabinetry styles that go on to become a classic – just like shaker kitchen cabinets. Regardless of your sense of taste and styling shaker kitchen cabinets complement with your theme and interior design so well that you can’t stop flattering on the elegance and élan of your kitchen. Inspired by the simple and practical way to lead a life of Shaker community, shaker kitchen cabinets have carved a niche for themselves in the cabinetry industry. Shaker kitchen cabinets, with its timeless and traditional design, complements both modern and rustic kitchen themes with ease. Shaker style furniture was originally created in America in 1820 by a group called the “Shakers”. This community was well known for living life around the principles of honesty, utility, and simplicity and the same reflected in their furniture as well. Early shaker cabinets were created using framed cabinet boxes made out of Cherry, Birch, Maple, Poplar, and other local American woods. However, with time, the styling and design evolved and incorporated a wide range of decorative features. The modern-day shaker kitchen cabinets can vary on the basis of finish and door styling. Apart from its classic style, there are many others advantages of installing shaker kitchen cabinets in the cooking space. 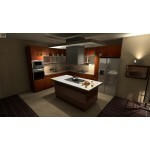 Kitchen remodeling is quite a tough and tedious task in its own sense. Apart from the efforts and time it takes to strategize kitchen design and remodeling, you need to take out time to select the design and style of the cabinets as well. When compared to other styles of kitchen cabinetry, shaker kitchen cabinets are easily available in the market in various styles and finishes. All you need to do is search for the perfect style of cabinets that matches your kitchen décor and styling. 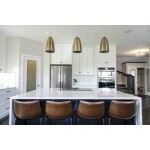 Well, this is another major advantage to choosing shaker kitchen cabinets over other styles. Cost and budget involved in kitchen remodeling is something that should be taken care of as a priority. Shaker style doors come at an affordable price as compared to its other counterparts like solid wood veneer cabinets and A-grade plywood cabinets. For example, the average total cost of buying and installing a shaker kitchen cabinet can be an approximate $490. On the other hand, all wood constructed arched kitchen cabinets can cost you somewhere around $2,327. No other cabinetry style can compete with the versatility of shaker cabinets. 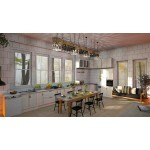 Shaker kitchen cabinets come in various styles and options to choose from. If you have a penchant for simplicity and timeless cabinet style then white shaker cabinets are the best match for your kitchen. However, distressed shaker cabinets also go well with the antique and traditional kitchen design. The utilitarian approach of shaker cabinets amalgamates the right proportions with a wide spectrum of designs, seamlessly. Shaker kitchen cabinets can easily be transformed to match traditional, country, modern and minimalist kitchen styles by incorporating simple and achievable changes. If you want to give your farmhouse kitchen a rustic feel, shaker kitchen cabinets are the best cabinetry options to install. These cabinetry options are cost-effective and easy to install and is flexible in terms of styling. Add some decorative edges for an exquisite look. You can also paint the cabinets with bright colors to get a vibrant feel or give a distressed look for a rustic and antique feel. No matter what style you want to give to your kitchen, styling shaker cabinets is easy and hassle-free. Well, we all leading very busy and jam-packed life where is very tough to strike a balance between professional and personal life. With such shortage of time, it is a tough task to allot time for cleaning and maintain the kitchen cabinets. Owing to the plain surface, shaker cabinets are easy to maintain and clean with no lines and gaps. You can easily remove any type of greasiness, oil residue, and dust and dirt with a single wipe. Shaker kitchen cabinets are a trademark of durability, quality, and exceptional designing that easily incorporates and complement every taste and styling approach. Owing to its flexibility shaker kitchen cabinets have withstood the test of time and has emerged as a classic in the cabinetry industry.